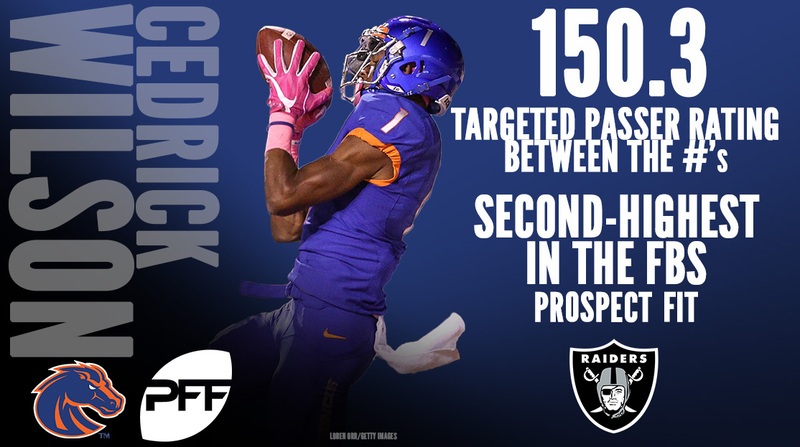 While the 2018 NFL Draft appears to lack true top-of-the-draft talent at wide receiver, the class does possess plenty of depth and versatility. From slot weapons to perimeter and deep threats, there is something for everyone this year, making scheme and fit critical components when it comes to projecting potential landing spots for prospects. Here are PFF’s top 10 receivers, along with some of the best potential team fits (independent of draft slot) for each player. T.Y. Hilton is one of the league’s top deep threats, but the Colts need better performers elsewhere in their corps, in particular on short and intermediate routes. 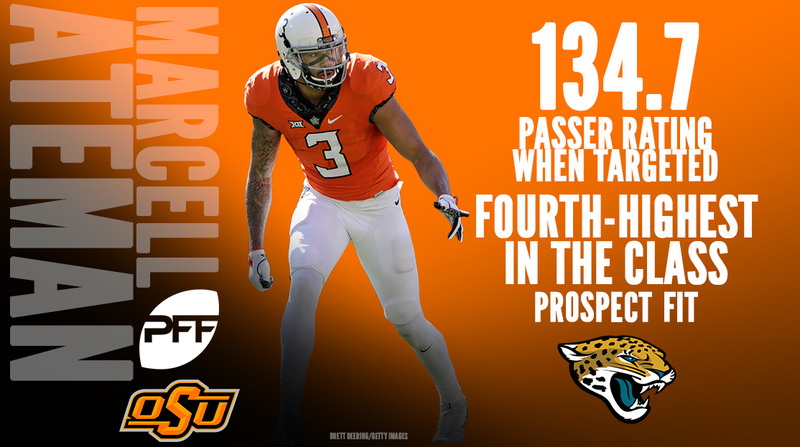 Gallup, the highest-graded FBS receiver in 2017 (92.0) and our No. 1 receiver prospect in the draft class, displayed outstanding production and efficiency throughout his college career. Last season, his 3.18 yards per route run was 15th-best in the country, but in 2016 he was even better and posted a mark of 4.34, second-best in FBS. His reliability extended to his hands as well, as he dropped just 12-of-191 catchable balls over the past two seasons. The Bears landed the top free agent prize at the wide receiver position in Allen Robinson, but they still need to stockpile additional weapons, particularly ones able to win vertically. Possessing outstanding acceleration off the line of scrimmage and out of his breaks, Ridley is able to consistently create separation on his routes despite not possessing elite straight-line speed. His production was limited due to Alabama’s run-heavy scheme, but he posted gains of at least 20 yards in 10-of-12 regular season games in 2017, and his 45.1 yards per catch average on deep passes was sixth-best in the draft class. Working under the tentative assumption the Dallas roster will otherwise remain as-is heading into the season, a dynamic, reliable deep threat opposite Dez Bryant has long been the missing link in the Cowboys’ offense. Washington ranked No. 1 in the country in both deep pass receptions (20) and yards (869) last season and was second in yards per route run at 3.59. He was also effective out of the slot, catching all 10 of his targets from the alignment for 343 yards and three scores. His route-running, agility and explosiveness was also on display throughout Senior Bowl week, as he was our highest-graded receiver during the week in Mobile. Much of this week’s headlines have been about the Giants’ apparent willingness to trade Odell Beckham Jr., but even if he remains in New York this season, the team needs a perimeter weapon capable of producing more than what Brandon Marshall can at this stage in his career. Sutton could provide the type of red zone and back-shoulder production the Giants need going forward, as he has the quickness and strength to get off press coverage at the line of scrimmage and the frame to win 50-50 balls in the air. He forced 26 missed tackles on 143 receptions over his last two seasons at SMU and posted at least nine scores each of the past three years. The Raiders replaced Michael Crabtree with Jordy Nelson this offseason, but they still need a viable slot option, as Seth Roberts ranked just 34th last year at 1.30 yards per route run from the slot and just 30th with a catch rate of 67.4 percent from the inside alignment. Wilson posted a wide receiver rating of 150.3 when targeted in the middle of the field at Boise State last year, second-best in FBS, and he led the country with 4.58 yards per route run against Power-5 conference opponents. Davante Adams has developed into a true top-performer at the wide receiver position, but the departure of Nelson leaves Green Bay in need of another weapon. The Packers would love the after-the-catch ability of Moore, as he forced 39 missed tackles on 146 career receptions at Maryland and averaged an impressive 7.0 yards after the catch. While he only caught 38.5 percent of contested targets, he still showed the ability to adjust to the ball in the air to make highlight-reel grabs and 50-50 balls wouldn’t be paramount for him in a place like Green Bay with an established playmaker like Adams already in the fold. The Jaguars have decided (at least in the short term) to make a commitment to Blake Bortles at quarterback, and with him in mind they would do well to target a receiver capable of consistently coming down with contested catches. 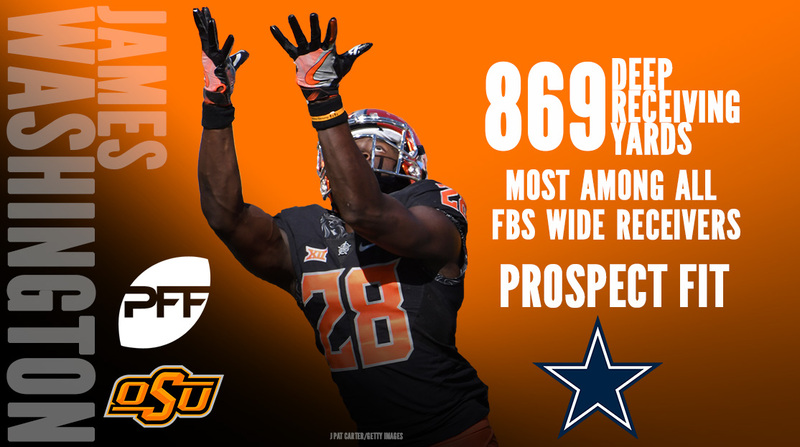 Ateman did just this at Oklahoma State, tallying 320 yards last season in contested situations and hauling in 15-of-20 targets to him while working against press coverage. The Patriots love receivers who can work the middle of the field and will be looking to fill the void in production left by the departed Danny Amendola, who played a much bigger role in New England’s offense last year with Julian Edelman on injured reserve. The shifty Miller finished sixth in the country in yards per route run from the slot in 2017 (3.43) and forced an outstanding 19 missed tackles after the catch. Adam Humphries ranked just 39th in the league with an average of 1.18 yards per route run from the slot and the Bucs would do well to target a more explosive playmaker for the role going forward. 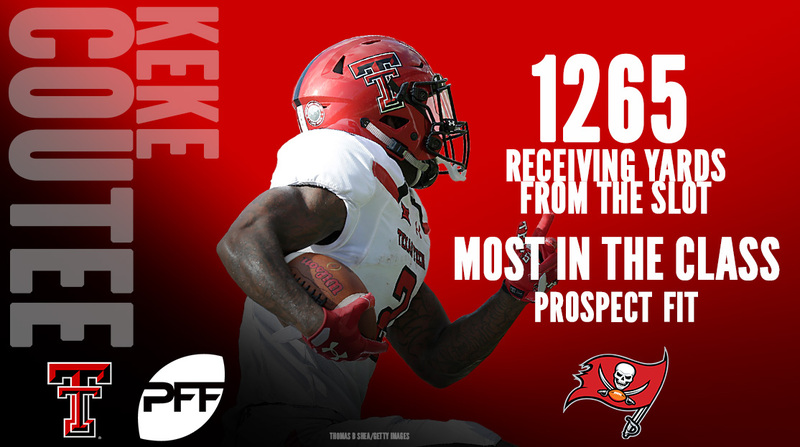 Coutee would be just that, as he racked up 1,265 yards from the slot at Texas Tech last year, best in the class, and forced 39 combined missed tackles after the catch in 2016 and 2017. 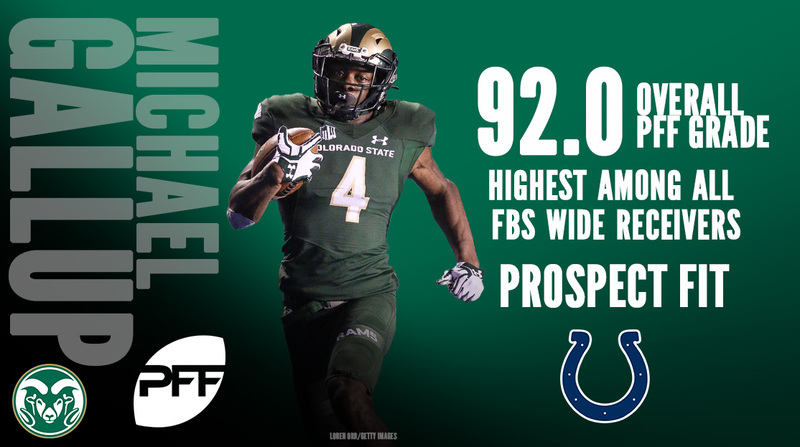 He was also one of the top deep threats in college football, putting up 542 receiving yards on targets at least 20 yards downfield on just 18 deep targets. The Ravens added Michael Crabtree and John Brown this offseason, but neither player is known for their work from the slot (Brown in particular has a yards per route run average under 1.0 each of the past two seasons). This is where Kirk made his home at Texas A&M, as he was fourth in FBS last year with 67 receptions from the slot, and third in yardage (891). He would also be a much-needed upgrade on special teams, as he returned six punts for touchdowns during his college career.